A Proven Program for Restoring Health! What is the most common cause of your symptoms? It's the FOOD! Food has the power to heal, and the power to harm. But how do you know which foods are causing your symptoms, and which foods are contributing to your health and well-being? Welcome to The Elimination Diet—a tool that’s been used by functional medicine practitioners for years to help people determine which foods they should eat, and which foods they should avoid for vibrant health. Heal your gut, gain energy, and improve your mood with an Elimination Diet! End the suffering. Find the diet that's right for you in the New Year! Join today and get access to all of the materials and videos. Have you already tried countless diets, doctors, and drugs and not found the answers you were looking for? Our proven 3-phase Elimination Diet Program already has helped thousands of people just like you. Whether you are suffering from skin disorders, headaches, IBS, joint pain, or chronic fatigue, The Elimination Diet can get to the root of your symptoms. Our newly upgraded Elimination Diet Support Program has been designed for those of you who have purchased The Elimination Diet book and would like personalized support from us during each stage of the diet. Everything you need to succeed is hosted in an online program hub within four phase-specific modules. You'll have access to our cooking videos, informational videos, daily MP3 audio support, recipe PDFs, and helpful program documents. Once you register you'll get invited to our private Facebook Support group where hundreds of active members will support you with recipes ideas as well as tips and tricks for success. Our program helps you stay on track in a group setting. You'll not only receive support from us but from everyone else going through the program at the same time. It's a fun way to make real, lasting dietary changes while making friends. As you may know by now, chronic inflammation is behind all diseases. You know that feeling when you start to get sick—the lethargy, the dull ache in your body, pain in your joints, or that dragging feeling of not being fully awake? That’s inflammation. It happens when you get sick, and it also happens when you consume foods that your body is sensitive to. When you eat foods every day that irritate your system, you cause chronic inflammation. When chronic inflammation is present, you create an environment for nearly every single disease to manifest. You can add in anti-inflammatory foods like ginger, turmeric, raw vegetable juices, and blueberries to calm the inflammation, but unless you get rid of what’s causing the inflammation to begin with—the foods you consume every day—you will never get better. That’s why the Elimination Diet can be your most powerful healing tool! You will discover, through a process of elimination and reintroduction, which foods are irritating your body and triggering your symptoms. Following an elimination diet can be tough, especially when you are doing a complete 180 with your diet. There can be intense cravings when eliminating certain addictive foods, lack of social support, new cooking techniques you may not be familiar with, and questions that can go unanswered without proper support. We’ve addressed all of the possible stumbling blocks you might run into during your Elimination Diet and put the solutions into action here in this online support program. You'll have all of the tips, tools, videos, recipes, and support you need once you register and login to our online program hub. Join Us, and Turn Your Health Around! We’ve helped thousands of people heal their debilitating health conditions through our proven 3-phase program and invite you to do the same with our online Elimination Diet Support Program. People are raving about our webinars! Judy says: "Every time I attend a webinar, I think that was the best webinar ever, and the next webinar I say the same thing!! Tom is awesome at what he does!! He has a lot of knowledge and experience and I am grateful to him for all of his help in getting us well!! Many thanks!" These recorded webinars cover key milestones of the diet beginning with the prep phase, so you will have all the support you need to make the changes you desire. “The Elimination Diet program really helped calm down my son's long-term gut issues. I encourage everyone to try this wonderful program, become educated about the root cause of disease, and take your health seriously.” ~Heather S.
“A few years after being diagnosed with Rheumatoid Arthritis I found the Whole Life Nutrition Elimination Diet. The first week was hard. I felt sick and sluggish, but within 10 days of starting the elimination diet I had a noticeable reduction in the amount of pain and discomfort I felt on a daily basis. I stayed in the Elimination phase for several months before I started reintroducing foods. I had a visit with my rheumatologist about 3 months in and he said my joints looked "excellent" (he didn't know I was doing the elimination diet). When I started reintroducing foods, I quickly determined that tomatoes and potatoes are trigger foods for me. The Whole Life Nutrition Elimination Diet provided the guidance I needed to start healing my body.” ~Krista S.
The Diet Designed for You! Our Elimination Diet program is comprised of three phases to help you feel better fast. First, we begin with a gentle detox phase to quickly calm the gut and promote fast healing, then an elimination phase that will nourish your body without exciting the immune cells, and lastly a reintroduction phase to identify the trigger foods that are contributing to your symptoms. We have variations in this program for pregnant and lactating women, as well as for children! For those suffering from severe gut disorders, we have options for a complex starch-free version as well as a low-FODMAP version. Everything is detailed in the program document you will receive once you sign up. You will also get more details during the first live webinar. Menu plans, Modification Guides, and more! Bonuses: All Elimination Diet Program Participants get $50 off an initial one-hour nutritional counseling appointment with Tom. Every participant gets access to their own supplement account from Thorne Research. You will receive 25% off and free shipping an all Thorne orders. We occasionally will be adding new recipes and cooking videos to the online program hub. With lifetime access you get the benefit of all future content additions! Register Today and Get Started Immediately! 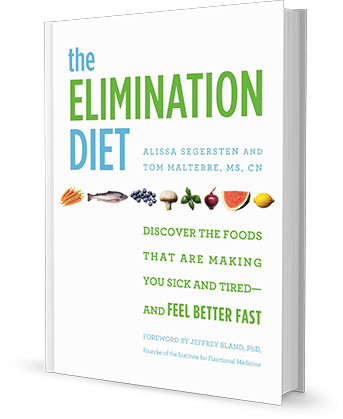 Order the Elimination Diet book! Register for the Elimination Diet Support Program! You'll get instant access to the whole program, plus past recorded live webinars so you can start your elimination diet today. Or begin reviewing the material and cooking the recipes so you can be as prepared as possible. Join the Program Today! Get Instant Access. All webinars have been recorded from previous live programs and can be found in the Hub once you register. Use the New Years Discount Code "elim2019" for $120 off the program today.